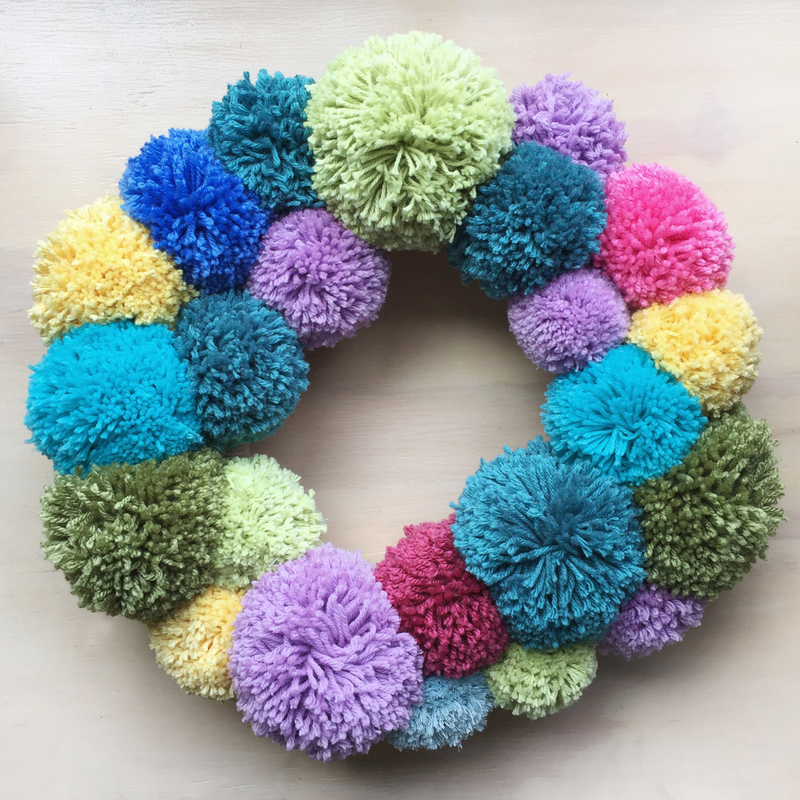 It's a pompom wreath! I thought I'd have this finished to send to a friend for the beginning of Spring. Well I got that wrong! It isn't meant to be a Christmas wreath, it's meant to be a spring, or any time wreath, hence the colours. 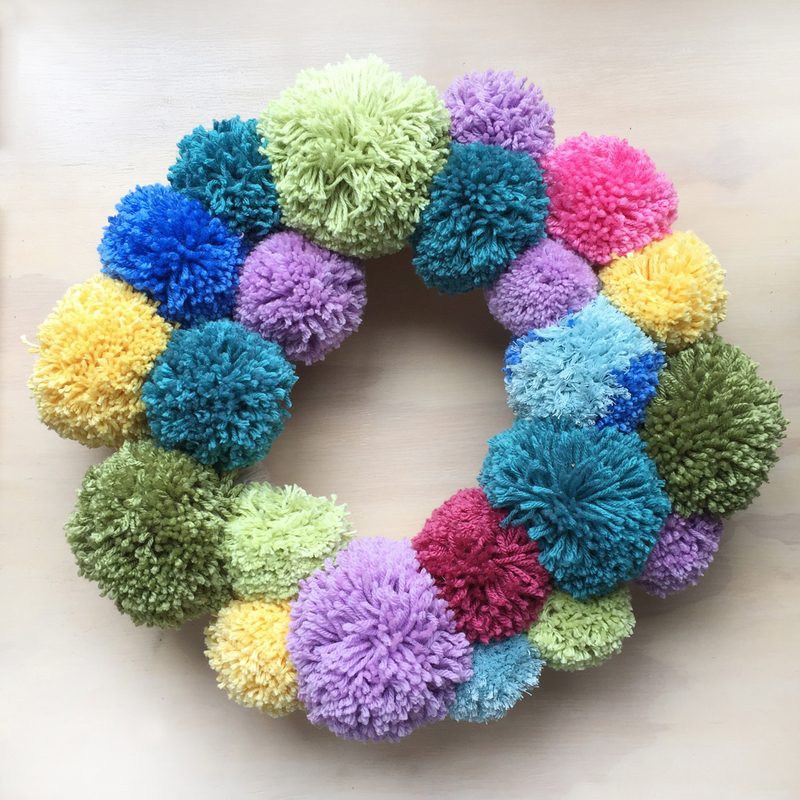 Or rather the colours I had inspired the purpose, pompoms are a great way to use up bits and pieces of yarn. Pretty sure I've talked about making them before, but I thought I'd share two methods I tried during this project. I'm still to try a method I feel gives a good result easily and - key point here - repeatably! The next one came with the french knitting dolly I bought earlier this year. 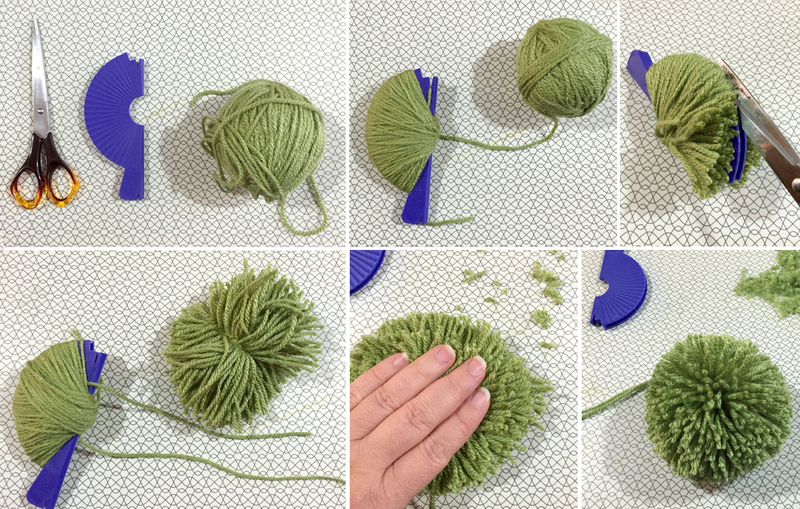 Nice dense pompom, but an awful lot of wasted yarn getting that egg shaped pompom into a circle. So the hunt continues! Initially I was just making these in the downtime from other projects, collecting a bright cheerful bunch of wooly balls. Then November came and I figured I'd better get this thing finished or it would need to be a winter wreath! 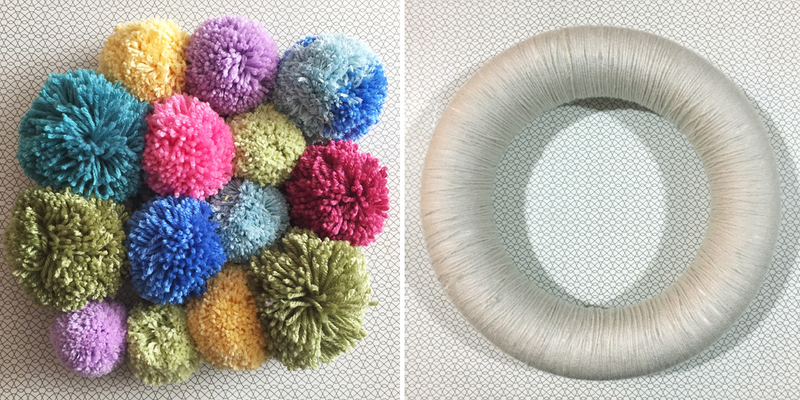 I settled on a foam wreath form to attach the pompoms, and wrapped it in yarn too, burning my finger with hot glue in the process (sign of a top notch craft project I hear). Which led to the big dilemma - I hadn't really planned any of this so as I reached the end of hot gluing the pompoms on to the wreath, I realised I still needed at least one more! Not happy with this first end result at all. You can see the gappy nature of the lower left hand side. Plus there was something about it that felt a bit off-kilter. Luckily Louise rescued me with yarn and some positive feedback at this point or I might have torn the thing up to salvage the foam. Some bright aqua yarn to the rescue, and once the gap seems plugged, I pulled the blue two-tone and popped an aqua pompom there as well. Much happier with this result! Thank you Louise! The wreath has been other hastily packaged and is off to the post office as I type. Gosh I hope it arrives in reasonable shape. 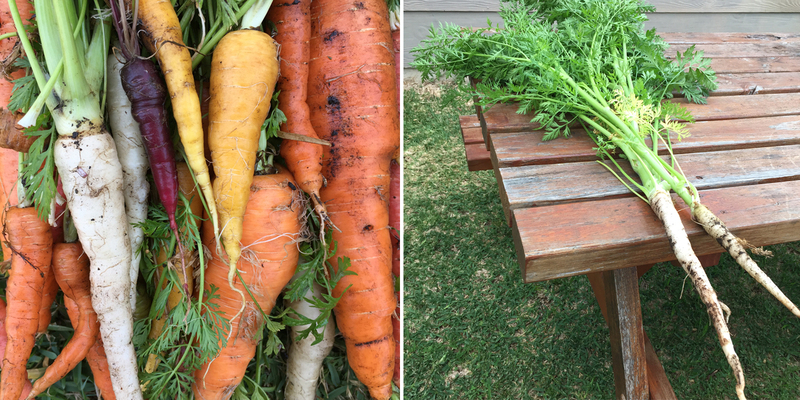 Just before I go, Mr has been a busy bee in the veg patch, and needed the space where the boys carrots were to plant a million other seedlings. Check out his haul! 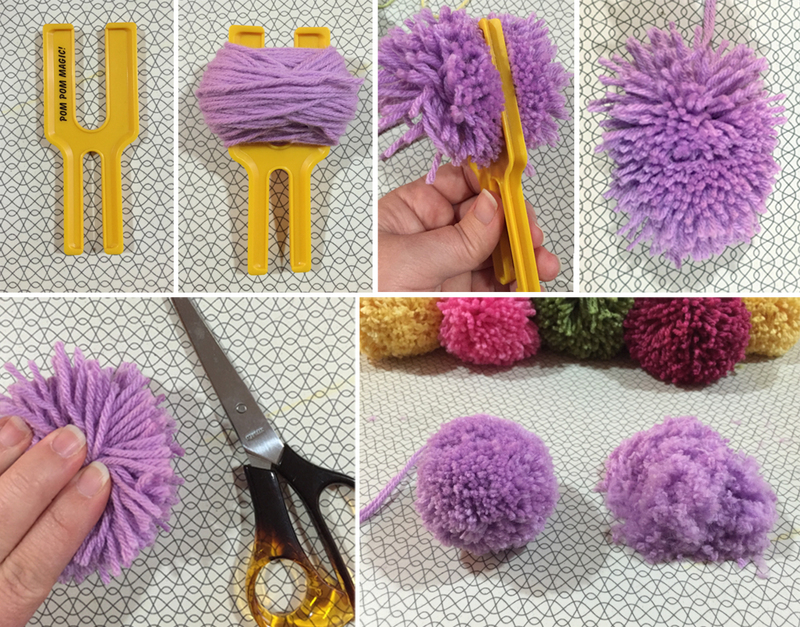 I love your dedicated to pom-pom perfection! Have you done the old fashioned method with two pieces of cardboard cut into rings? I really love how it looks and I'm delighted that I got to help by posting yarn! I hope Flick likes it! I hope it arrives in one piece!